Blackinton B409 Badge with Eagle - B409 - 2 1/8" x 3 1/4"
Home > Blackinton > Police Badges > Badges with Eagles > B409 Badge with Eagle - B409 - 2 1/8" x 3 1/4"
B409 Badge with Eagle - B409 - 2 1/8" x 3 1/4"
Brought to you by Blackinton, a trusted name in shield craftsmanship since 1852, the Blackington B427 badge offers a larger version of the B1507, reminiscent of the Maltese Cross, with an eagle clutching a ribbon atop. The B427 also gives a spacious round center area for whichever seal your department requires. 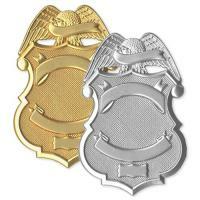 Made of durable materials and available in several finishes, you can depend on this badge to last for years. Blackington Badges are custom ordered so please allow enough lead time for the custom Blackington build. Dimensions: 2 1/8" x 3 1/4"
©2002-2019 CopsPlus.com: Blackinton B409 Badge with Eagle - B409 - 2 1/8" x 3 1/4"